You’re embarking on an adventure to a healthier and happier you. You can almost feel the fruitful life it will bring you. Strength, ease, and power radiating through your being and out of your heart. Once you reach the top of the mountain towards your dream, you stretch your arms up in the air, feel the wind lifting you up, and embrace the sensation of success and self-admiration. Whatever your goal, providing a stable grounding is essential before taking the leap and beginning your trek. When it comes to health and nutrition, the grounding base is meal planning. Envisioning and visioning will help you see into your future. So having a weekly meal planner template that you can print out and see on a daily basis, will manifest your ideal plan. This free printable meal planner will take it to the next level. It will support you in finding specialized structure. Combining a meal planning app with your own handwritten personality will solidify and engrain your intentions. 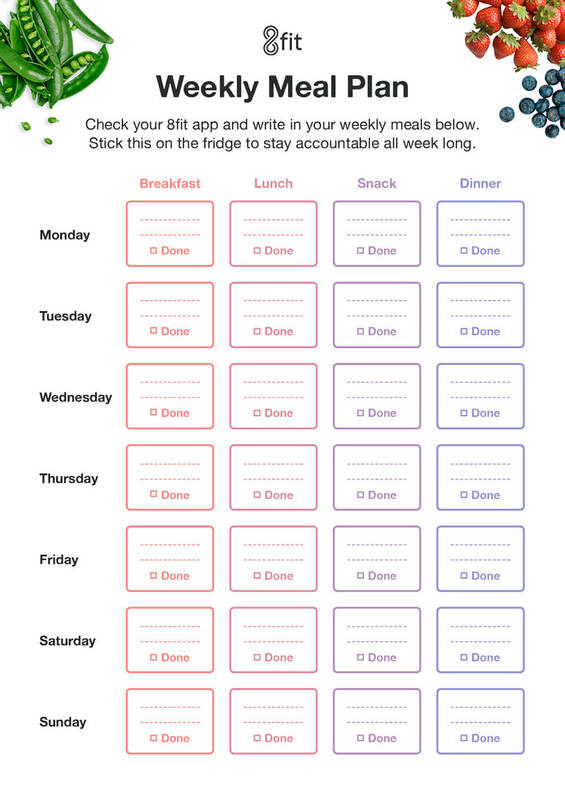 This weekly meal planner template goes hand in hand with the 8fit app. Start by heading to your 8fit meal plan. Plan your weekly meals according to what you have in your kitchen, what you are excited to try, or simply what sounds good this week. You get to be your own culinary director. Want more details? Try our step-by-step directions. Print your free printable meal planner. I recommend doing it in color ink so it pops. Transfer the information directly from the app to your form. Write in each of the meals for the upcoming week. Don’t stress about writing portions since the meal planning app already adjusts them to your goal, gender, age, weight, height and physical activity level. Do what works best for you here. I love making up my own names, like “delicious banana pancakes! !” Drawings are also welcome 🙂 Place your meal plan somewhere that you see every day. I like using the fridge because it is somewhere I will see daily and keeps me accountable when I want to mindlessly snack. Print a couple copies and have them ready to fill out for the upcoming weeks. Save and print the graphic below and there you go (free download here)! Let’s walk through it together. I follow a pretty standard diet but modify the meal plan to fit my unique allergies and exclusions. For example, I click that I don’t want bell peppers since they always give me an unsettled stomach. Then I customize the type of recipes I want (quick, simple, affordable, family-friendly, meal prep, gourmet). I’m aiming to make my life easier and set myself up for success by meal planning so I choose meal prep. Since my free printable meal planner includes three meals and one snack, I will update my preferences accordingly. Et voila — my meal plan is ready! It looks like I’ll be having bread with avocado and sunny side egg for breakfast three days, then peanut butter overnight oats the remaining four. For lunch, I have quick basil fish and chickpea, feta, and kale salad. Snacks will consist of carrot and cucumber sticks with almond butter and apple, yogurt and peanut butter. Finally, my healthy dinner meals are chickpea salad with lemon yogurt dressing and one-pan roasted chicken, sweet potato and broccoli. Yum! Since all of these are meals that I like, there’s no need to swap any. I notice that some of the meals repeat, which makes sense for meal prepping and much easier for buying food for the week. I’ve got my handy weekly meal planner template with grocery list ready. I scroll through the delicious looking meals for the week and hand-write them in the my meal plan. I shorten the names for ease. All I need is a keyword to remind me. I head back into the app and select the cute little shopping cart icon in the corner. I choose to shop for the next seven days. Now I have a weekly meal planner template with grocery list. My chances of healthy eating and money saving are much higher this week. I know that thinking about making a meal plan sounds like a lot of effort, but consider the amount of time it takes for you to commute to a restaurant and wait for your order to be filled. Not to mention that trying to find food that is healthy (i.e., no fast food) can be close to impossible in a hurry. If you meal prep, you may actually end up saving time. It has been proven that writing down what you eat, aids in weight loss and healthy eating efforts. This is partially due to the fact that it increases your awareness and accountability. You will identify your food-related habits and what’s been getting in your way. Consistent meals help teach your body that fuel is available and therefore prevent derailing cravings. Through meal prep, you can help the environment by reducing your overall food waste. Remember that we allow and encourage you to make substitutions to accommodate for what you have on hand. If you have extras of any ingredient, try to include a meal with that ingredient the following week. For instance, use that leftover rice for one of our other rice dishes. We encourage you to substitute ingredients. Most vegetables (minus the starchy ones: potatoes, carrots, pumpkin, beets, peas, corn) can be replaced by others. Same with fruits for other fruits, nuts for other nuts or seeds, and grains for other grains that are the same weight as what your ingredient list indicates. To recap the benefits we’ve been mentioning, meal planning can help control cost, help you save time, help with weight management and portion control, can contribute to a balanced diet, and reduce your mid-week stress. Turn your post work panic into time for enjoying your meal and practicing mindful eating. Arm yourself with the tools you need for food prep. I recommend buying enough tupperware or containers that will get you through a week. When you cook a hot meal, keep the tupperware lid partially cracked so the hot air can escape. Don’t take this lightly. Food safety is extremely important for your health. Give hot food time to cool before putting in your fridge or else it will heat up the food that is already in there. But don’t keep your food out for too long. Unhealthy bacteria grow in the danger zone — 40°F(5°C) to 140°F(60°C). Keep your food in this zone for no more than 2 hours. We recommend keeping prepared meals for 3-4 days in the fridge and 3-4 months in the freezer. Foods with delicate fresh fruits or vegetables (such as salad) will not keep as well in the freezer. If you have a salad in your meal plan, keep the dressing separate from the salad until you are ready to serve. This will help keep it fresh and not soggy. A weekly printable meal planner template will have a big impact on your health, budget, and schedule. Consider it the base of your journey towards a healthier lifestyle. It’s customizable and can be adjusted according to your preferences, schedule, and personal goals. Planning, preparing, and packaging your own meals and snacks are easy steps, building lifelong healthy habits. Meal plansWhy Use a Healthy Meal Planning App?